In gamma-ray astronomy, gamma-ray bursts (GRBs) are extremely energetic explosions that have been observed in distant galaxies. They are the brightest electromagnetic events known to occur in the universe. Bursts can last from ten milliseconds to several hours. After an initial flash of gamma rays, a longer-lived "afterglow" is usually emitted at longer wavelengths. The photon is a type of elementary particle, the quantum of the electromagnetic field including electromagnetic radiation such as light, and the force carrier for the electromagnetic force. The photon has zero rest mass and always moves at the speed of light within a vacuum. Astronomer Chryssa Kouveliotou of the Universities Space Research Association (USRA) at NASA's Marshall Space Flight Center decided to test the theory that soft gamma repeaters were magnetars. According to the theory, the bursts would cause the object to slow down its rotation. In 1998,   she made careful comparisons of the periodicity of soft gamma repeater SGR 1806-20. The period had increased by 0.008 seconds since 1993, and she calculated that this would be explained by a magnetar with a magnetic-field strength of 8×1010 teslas (8×1014 gauss). This was enough to convince the international astronomical community that soft gamma repeaters are indeed magnetars. Chryssa Kouveliotou is a Greek astrophysicist. She is a professor at George Washington University and a retired senior technologist in high-energy astrophysics at NASA's Marshall Space Flight Center in Huntsville, Alabama. SGR 1806-20 is a magnetar, a type of neutron star with a very powerful magnetic field, that was discovered in 1979 and identified as a soft gamma repeater. SGR 1806-20 is located about 14.5 kiloparsecs (50,000 light-years) from Earth on the far side of the Milky Way galaxy in the constellation of Sagittarius. It has a diameter of no more than 20 kilometres (12 mi) and rotates on its axis every 7.5 seconds (30,000 km/h rotation speed at the surface). As of 2016, SGR 1806-20 is the most highly magnetized object ever observed, with a magnetic field over 1015 gauss (G) (1011 tesla) in intensity (compared to the Sun's 1–5 G and Earth's 0.25–0.65 G). SGR 1900+14 is a soft gamma repeater (SGR), located in the constellation of Aquila about 20,000 light-years away. It is assumed to be an example of an intensely magnetic star, known as a magnetar. It is thought to have formed after a fairly recent supernova explosion. The ionosphere is the ionized part of Earth's upper atmosphere, from about 60 km (37 mi) to 1,000 km (620 mi) altitude, a region that includes the thermosphere and parts of the mesosphere and exosphere. The ionosphere is ionized by solar radiation. It plays an important role in atmospheric electricity and forms the inner edge of the magnetosphere. It has practical importance because, among other functions, it influences radio propagation to distant places on the Earth. SGR J1550-5418  2008 Rotates once every 2.07 seconds, holds the record for the fastest-spinning magnetar. Right ascension is the angular distance of a particular point measured eastward along the celestial equator from the Sun at the March equinox to the point above the earth in question. When paired with declination, these astronomical coordinates specify the direction of a point on the celestial sphere in the equatorial coordinate system. Anomalous X-ray Pulsars (AXPs) are now widely believed to be magnetars—young, isolated, highly magnetized neutron stars. These energetic X-ray pulsars are characterized by slow rotation periods of ~2–12 seconds and large magnetic fields of ~1013–1015 gauss (1 to 100 gigateslas). There are currently (as of 2017) 12 confirmed and 2 candidate AXPs. The identification of AXPs with magnetars was motivated by their similarity to another enigmatic class of sources, the soft gamma repeaters. A stellar magnetic field is a magnetic field generated by the motion of conductive plasma inside a star. This motion is created through convection, which is a form of energy transport involving the physical movement of material. A localized magnetic field exerts a force on the plasma, effectively increasing the pressure without a comparable gain in density. As a result, the magnetized region rises relative to the remainder of the plasma, until it reaches the star's photosphere. This creates starspots on the surface, and the related phenomenon of coronal loops. Gamma-ray burst progenitors are the types of celestial objects that can emit gamma-ray bursts (GRBs). GRBs show an extraordinary degree of diversity. They can last anywhere from a fraction of a second to many minutes. Bursts could have a single profile or oscillate wildly up and down in intensity, and their spectra are highly variable unlike other objects in space. The near complete lack of observational constraint led to a profusion of theories, including evaporating black holes, magnetic flares on white dwarfs, accretion of matter onto neutron stars, antimatter accretion, supernovae, hypernovae, and rapid extraction of rotational energy from supermassive black holes, among others. SGR 0525-66 is a soft gamma repeater (SGR), located in the Super-Nova Remnant (SNR) 0525-66.1, otherwise known as N49, in the Large Magellanic Cloud. It was the first soft gamma repeater discovered, and as of 2015, the only known located outside our galaxy. SGR 1627-41, is a soft gamma repeater (SGR), located in the constellation of Ara. It was discovered June 15, 1998 using the Burst and transient Source Experiment (BATSE) and was the first soft gamma repeater to be discovered since 1979. During a period of 6 weeks, the star bursted approximately 100 times, and then went quiet. The measured bursts lasted an average of 100 milliseconds, but ranged from 25 ms to 1.8 seconds. AGR 1627-41 is a persistent X-ray source. It is located at a distance of 11 kpc in the radio complex CTB 33, a star forming region that includes the supernova remnant G337.0-0.1. SGR J1550-5418 is a soft gamma repeater (SGR), the sixth to be discovered, located in the constellation Norma. Long known as an X-ray source, it was noticed to have become active on 23 October 2008, and then after a relatively quiescent interval, became much more active on 22 January 2009. It has been observed by the Swift satellite, and by the Fermi Gamma-ray Space Telescope, launched in 2008, as well as in X-ray and radio emission. It has been observed to emit intense bursts of gamma rays at a rate of up to several per minute. At its estimated distance of 30,000 light years, the most intense flares equal the total energy emission of the Sun in ~20 years. Gamma-ray astronomy is the astronomical observation of gamma rays, the most energetic form of electromagnetic radiation, with photon energies above 100 keV. Radiation below 100 keV is classified as X-rays and is the subject of X-ray astronomy. SGR 0501+4516 is a soft gamma repeater (SGR), and is an ancient stellar remnant. Currently, the phenomenons of SGRs and the related Anomalous X-ray pulsars (AXP) are explained as arising from magnetars. SGR 0501+4516 is located approximately 15,000 light years from Earth and has a magnetic field 100 trillion times stronger than the Earth’s. 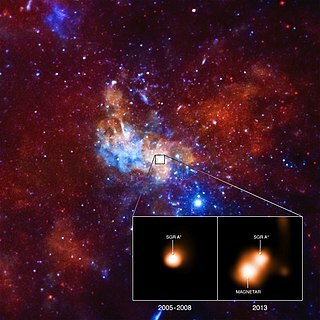 SGR J1745−2900 or PSR J1745-2900 is the first discovered magnetar, orbiting a black hole in the Sagittarius A* system. The magnetar was discovered in 2013 using the Effelsberg 100-m Radio Telescope, the Nancay Decimetric Radio Telescope, and the Jodrell Bank Lovell Telescope. The magnetar has a period of 3.76 s and a magnetic field of ∼ 1014 G (1010 T). GRB 790305b is an event that took place on 5 March 1979. It was an extremely bright burst that was successfully localized to supernova remnant N49 in the Large Magellanic Cloud. This event is now interpreted as a magnetar giant flare, more related to SGR flares than "true" gamma-ray bursts. It is the first observed SGR megaflare, a specific type of short GRB. It has been associated with the pulsar PSR B0525-66. The Imaging X-ray Polarimetry Explorer (IXPE) is a future space observatory with three identical telescopes designed to measure the polarization of cosmic X-rays. The mission will study exotic astronomical objects and permit mapping the magnetic fields of black holes, neutron stars, pulsars, supernova remnants, magnetars, quasars, and active galactic nuclei. The high-energy X-ray radiation from these objects' surrounding environment can be polarized – vibrating in a particular direction. Studying the polarization of X-rays reveals the physics of these objects and can provide insights into the high-temperature environments where they are created. ↑ Zhang, Bing; Xu, R.X. ; Qiao, G.J. (2000). "Nature and Nurture: a Model for Soft Gamma-Ray Repeaters". The Astrophysical Journal. 545 (2): 127–129. arXiv: astro-ph/0010225 . Bibcode:2000ApJ...545L.127Z. doi:10.1086/317889. 1 2 3 4 Duncan, Robert C. (May 1998). "The March 5th Event". Magnetars', Soft Gamma Repeaters & Very Strong Magnetic Fields. University of Texas at Austin . Retrieved March 2, 2009. 1 2 3 4 Dooling, Dave (May 20, 1998). ""Magnetar" discovery solves 19-year-old mystery". NASA. Archived from the original on March 11, 2009. Retrieved March 2, 2009. ↑ "McGill SGR/AXP Online Catalog". ↑ "Star Emits Intense Celestial Fireworks". Space.com. 10 February 2009. ↑ "Giant eruption reveals 'dead' star". European Space Agency. 16 June 2009. Retrieved 28 December 2009.